Paul Gosar has served in the US House of Representatives since 2011. He currently represents Arizona’s 4th congressional district. He opposes sage grouse conservation and efforts to curb methane pollution, and has criticized the Land and Water Conservation Fund. He has applauded the Trump administration’s national monument reductions, and supports giving the Bureau of Land Management more authority to seize and sell off public land. Rep. Gosar supports the Trump administration’s rollback of national monuments. Gosar is critical of the Land and Water Conservation Fund (LWCF). Gosar supports giving BLM more power to seize and sell off public land. 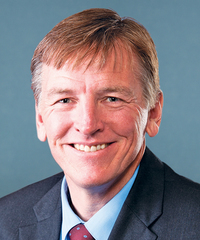 Gosar opposes sage grouse conservation. Gosar opposes reducing methane emissions.